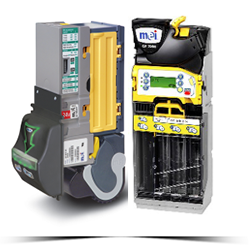 Merchandiser Exchange offers a wide variety of vending equipment parts. These are available to purchase directly or to shorten the time we need to repair your equipment. Due to our large inventory of parts, we can typically repair equipment same day. Either way, our practice of keeping parts on-hand usually results in less downtime for your machines. Contact us today at 267-799-5743 or e-mail info@merchandiserexchange.com for a full list of available parts or to inquire if a specific item is currently in our inventory.